MISSION – As the Rosebud Sioux Tribe celebrated the fifth anniversary March 29 of founding its spirit camp to protect nature from the proposed Keystone XL Pipeline, U.S. President Donald Trump advanced the Canadian tar-sands crude-oil slurry project by revoking its stalled State Department permit and issuing a fast-track executive proclamation. If unopposed, the order would allow construction to go forward despite a federal court suspension of the State Department Presidential Permit, requiring further study before approval. The Indigenous Environmental Network responded by calling the order “an attempt by the President to bypass federal environmental laws. “In defense of the sacred and the protection of indigenous peoples, we will continue to fight this pipeline, even if that means further legal action against the office of the President of the United States,” the Bemidji-based non-profit alliance said in a written statement. Trump’s document professes to be an instrument that “supersedes” the State Department’s Presidential Permit issued March 23, 2017. However, the earlier permit applied to the full length of the segment of the pipeline that remains to be built through unceded 1868 Ft. Laramie Treaty territory in Montana, South Dakota, and Nebraska. If completed, the Keystone XL Pipeline would carry diluted bitumen, or dilbit, from the tar-sands mines of the Athabascan homelands in Alberta to the Texas Gulf Coast refineries and export terminals. The memorandum only covers construction at “border facilities,” consisting of a 36-inch diameter pipeline extending from Canada “to and including the first mainline shut-off valve in the United States,” located approximately 1.2 miles from the international boundary. The announcement came as tribal governments and ranchers along the route were struggling to survive monumental spring storm runoff that is creating mud plains and stranding residents for weeks. “In the face of historic flooding in Nebraska and South Dakota, the Trump Administration issues another proclamation attempting to shove a risky tar-sands pipeline down the throats of farmers and ranchers currently facing devastation,” said Jane Kleeb, Bold Nebraska founder. The past Administration had denied the Presidential Permit to build into the United States and Trump overturned that with the flourish of a pen during his first week in office, as promised on the campaign trail. “Instead of helping the heartland, Trump is driving a stake through the hearts of family farmers and ranchers and tribal nations who are trying to protect the land and water from a foreign oil pipeline,” she said in a written statement. The White House action followed the announcement one day earlier of a lawsuit against the state of South Dakota for Gov. Kristi Noem’s recently approved Riot Busting Act, so-called after she coined the phrase “riot busting” in drafting the measure she said was aimed at avoiding costs to the government for conflicts the Keystone XL project is anticipated to engender. The act says that “anyone that contributes to a protest, whether through monetary donations, donations of supplies, or even through organizing a page on social media, can be held liable, and have civil and criminal penalties for supporting a protest that the state deems violent,” plaintiffs claimed. “Individuals or organizations that support a protest don’t even need to be on the ground or physically present at the protest to be held liable,” plaintiffs added. Also under the law, TransCanada Corp. could use money obtained from protesters and organizations to promote pipeline construction,” they alleged. “Gov. Kristi Noem’s legislation is yet another way to promote Big Oil interests and prevent dissent by making protesters subject to legal action,” said Kim Pate, vice-president of NDN Collective. Cherokee and Choctaw, Pate is an attorney with 25 years of experience in civil rights litigation. 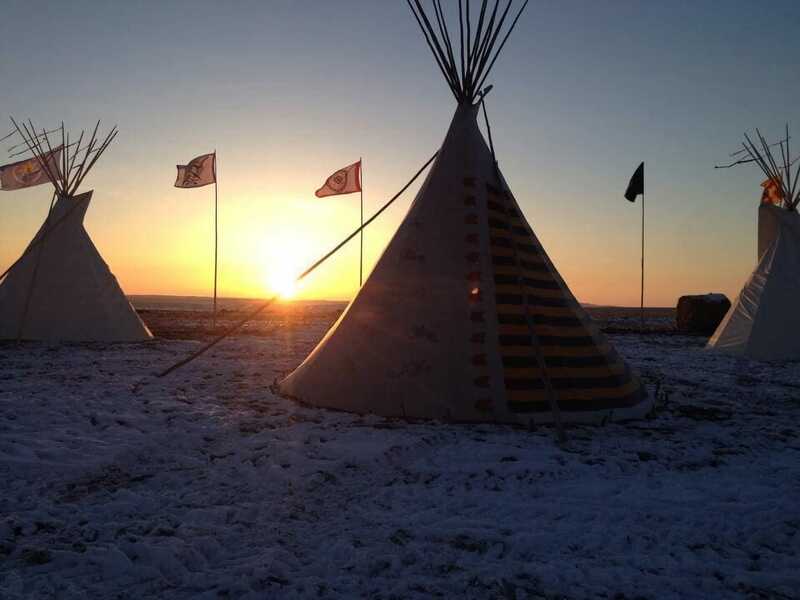 Joining her organization in the lawsuit prepared by the ACLU are the Indigenous Environmental Network, the Sierra Club, and Dakota Rural Action, as well as Oglala Lakota’s Dallas Goldtooth of the Indigenous Environmental Network, and Nick Tilsen, president and CEO of the NDN Collective. “These laws are absurd,” Tilsen said. “This is just the latest of tactics and strategies to muzzle the voices of the people, to discourage us from organizing our communities against injustice and threats to our livelihood. “It’s also an attempt to over-militarize indigenous peoples’ resistance, criminalizing our work to defend, develop and decolonize indigenous lands and our communities,” he said in a written release. Keystone XL has been on hold since a November 2018 Montana U.S. District Court decision to halt pre-construction at least until a supplemental environmental impact statement is completed, as required by the National Environmental Protection Act, for a route-change ordered by Nebraska state court. The U.S. Ninth Circuit Court of Appeals has not granted TransCanada’s appeal to overturn the pre-construction hold, a demand of tribes, indigenous organizers, and environmental groups. NDN’s Tilsen insisted that the same could be said of the Riot Boosting Act. “This law is not only an attack on water protectors, activists and those who support us; it’s an attack on democracy itself,” he noted. Hoff called the pipeline “a dangerous project that would threaten the drinking water for tens of thousands of Montanans downstream from its Missouri River crossing. Furthermore, it endangers the livelihoods of farmers and ranchers who depend on clean water,” she said. “It is a sad day when a United States President thumbs his nose at the law for a project that only benefits a foreign corporation while putting Americans at risk,” she added. This article was originally published at Native Sun News. It has been re-published at IC with permission.